Think outside the box—build a DIY pinball machine with it. This Made in the USA kit comes with everything you need to build a full-fledged machine with cardboard. Build, customize obstacles, then decorate. You won’t need batteries, tools, or screens—just some ready-to-fold hands. Dimensions: Box: 24" x 14" x 2.6"; Assembled: 24” x 14” x 12"
Great alternative to tech gifts! So nice we bought it twice! Want a pinball machine? Make it. 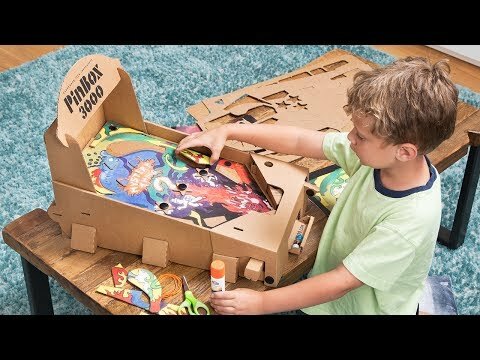 This Made in the USA, DIY pinball machine comes with everything you need (39 recyclable parts, easy-to-follow instructions, marbles, and blank cardboard) to make a full-fledged machine. It was invented by two professors, who wanted to encourage technology-free exploration—which is why there are no tools, batteries, or screens involved. All you need is an hour or so, and hands that are ready to fold. Once you’ve built your base, customize the playfield with obstacles and pathways. 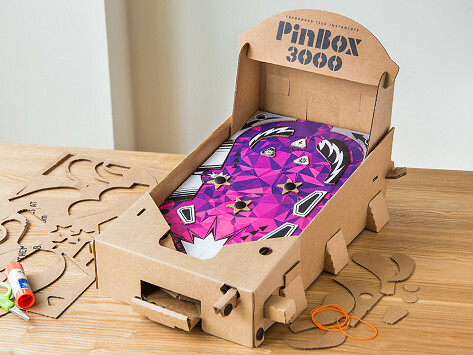 The cardboard doubles as a canvas you can paint over—or, alternately, print out PinBox 3000’s graphics to add some of their colorful flair. Now you can shoot, sling, and score using an American-made, homemade arcade game.